SophieDelebarre Council – is a consulting organisation based in La Madeleine (close to Lille) and specialised in consulting European projects engineering and support in the field of social innovation for the experiment, the construction and the transfer of methods and innovative tools which favour the social and professional inclusion of the most fragile public, in particular the young people. It works directly in management and animation of transnational partnership of projects or as external support for project leaders, either on missions of capitalisation and modelling, or on missions of evaluation. 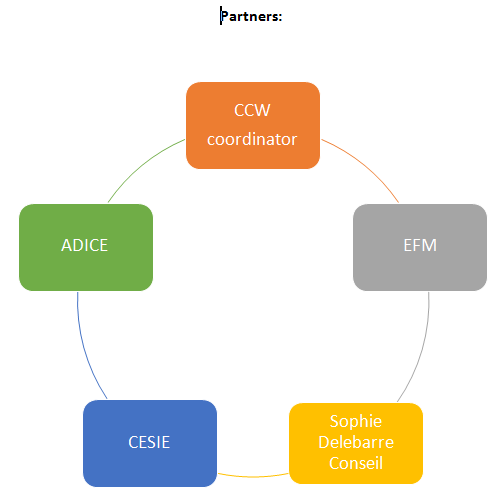 COPE is complementary with E2MP project (https://www.careerchangewales.co.uk/e2mp-project/) developed by the same consortium. While E2MP trains the youth managers, COPE will train directly the youth, both projects target directly or indirectly young people with fewer opportunities. COPE’s rationale is focused on two top key elements of the EU policies: social inclusion and unemployment among youth with fewer opportunities. Connect young people in Europe with the aim of increasing social inclusion, promoting EU values, diversity acceptance and inter-cultural and social dialogue. COPE encourages the youth to support their peers in need through voluntarism and learning exchanges. Decrease young people’s fears related to mobility through guidance.